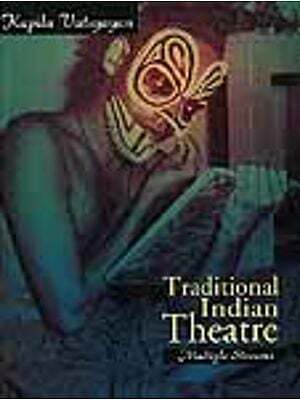 Bhand Pather is an age-old traditional theatre form of Kashmir; generally held in open spaces. Interestingly in this theatre form, there is no pre-determined script, since it belongs to the oral tradition, handed down from one generation to the other, in the Guru-shishya parampara. Although the themes are old, the performance is always new, as it manifests itself n a new space and time. The Bhand actors skillfully weave and infuse contemporary religious, social and political issues into the prevalent stories of the plays from the repertoire in such a manner that every performance has something fresh to the audience. Though rustic in nature and presentation, the vocabulary of Bhand Pather is elevated to higher grounds with intermittent allusions to the Vakhs and Shruks of several great medieval and modern mystics of Kashmir. Over a vast period of time, Bhand Pather has evolved as a mature and complete theatrical experience. To expound the academic, historical, cultural and performative perspectives of this rare art-form at an institutional level, the IGNCA organized a three-day festival titled ‘Revisiting Bhand Pather: folk theatre of Kashmir’ under its ‘Shastra and Prayoga’ programme. 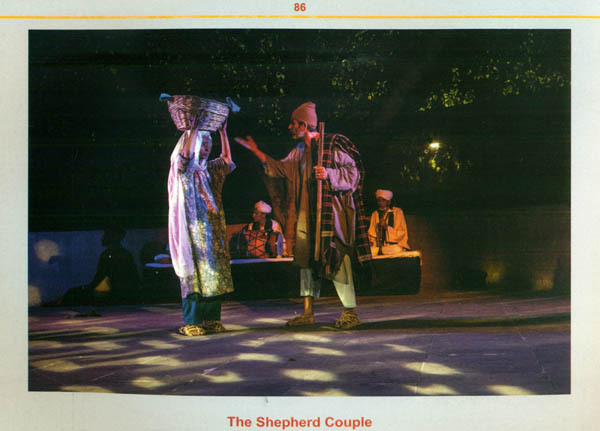 During this festival, stage performance of three Bhand Pather plays, namely, Gosain Pather, Shikaragah Pather and Badshah Pather was organized in the amphitheatre of the IGNCA for three successive days. The present illustrated monograph is an attempt to encapsulate the spirit of the said present a visual treat to the general readers and connoisseurs alike. Dr. Sushma Jatoo is a senior researcher in the Kalakosa division of the IGNCA, and is looking after several important projects of the centre, especially on Indian Musicology and Indian Architecture, etc. She has keen interest in the studies of art, culture, literary traditions, philosophy, etc. and is committed to bringing forth a holistic view of Indian artistic traditions along with exploring the movement of Indian intellectual traditions in Indian as well as in Asis. She has presented some interesting and intriguing research paper in various national and international conferences and has contributed several articles and books on above mentioned themes of Indology. She is a member of several executive committees of IGNCA and other sister organizations. Dr. Sudhir Lall is a senior researcher in the Kalakosa Division of the IGNCA, and is looking after the official projects on Indian Poetics, Indian Architecture and Vaisnuvagems, along with his personal research projects. He is deeply interested in exploring the inter-and multi-discipinarity of ancient Indian thought and its cross-cultural perspectives and remains an incisive student of religious studies, literature and philosophies. He has presented some thought-provoking research papers in various national seminars and international conferences and has also contribute quite a few articles and books on various topics related and nooks on various topics related to Indic studies. He is a member of various committee of the IGNCA and other cultural organizations. 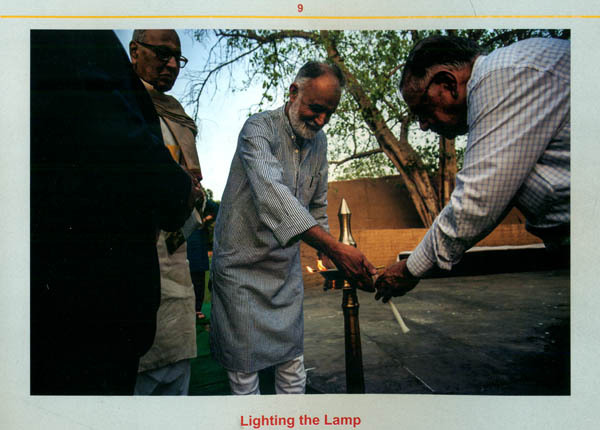 It is an matter of immense pleasure for us at the Indira Gandhi National Centre for the Arts (IGNCA) to present an illustrated monograph on ‘Bhand Pather: The Folk Theatre of Kashmir’ top scholars, artistes, connoisseurs of Indian arts and all other esteemed readers. During the silver Jubilee celebrations to mark the establishment of IGNCA, a three day festival on this vibrant an traditional folk theatre form was organized under the aegis of the ‘Shastra and Programme’ of the Centre, which explores the interactions between traditional theoretical precepts and their performative aspects. Bhands are traditional performers of the Vale of Kaashmir and Bhand Pather has farce as one of its key elements. It portrays social, cultural, political and religious dilemmas, tensions and hypocrisies through mimicry, realism, satire and comedy. While evoking amusement and irony, it also cleverly conveys many meaningful messages to the audience. The festival was organized to underscore the cultural significance of the this art-form, its present circumstances and the contemporary challenges it faces. IGNCA engaged the renowned theatre and film director M.K. Raina t direct the three BHand Pathers (plays) from the Bhand repertoire. Very few people have the in-depth knowledge of this art from that Mr. Raina has. During the festival, a large group of – 24 Bhands (perfeomers) hailing from Akingam in Kashmir, which is believed to be the birthplace of this art-from, demonstrated their hereditary acting and miming skills, accompanied by enchantin music. The amphitheatre of IGNCA was virtually transformed into Kashmir village, wherein the artistes brought to life a plethora of character from Gosain OPather, Shikargah Pather and Badshah Pather. 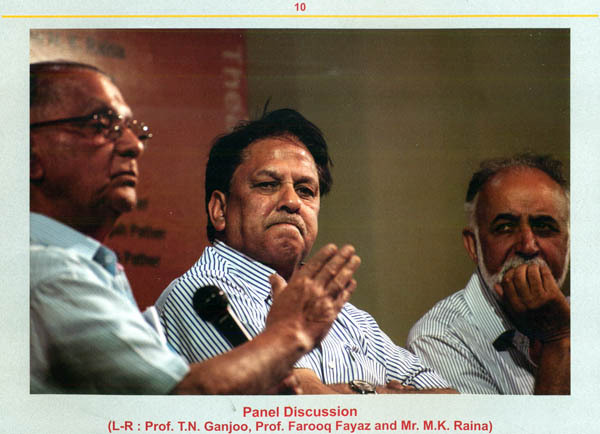 A panel discussion on Bhand Pather was also organized, in wich eminent scholars on the subject discussed various historical and social aspects of this art-form alsong with suggestions on the way forward. I congratukate the team of Kalakosa scholars, especially Dr. Sushma Jatoo, for organizing this unique event and bringing out this illustrated monograph on the festival. It is hoped that this traditional and time-honoured art-form is rejuvenated and restored to its rightful place among Indian performing art. Indira Gandhi National Centre for the Arts (IGNCA) is an autonomous Trust set up by the Govt. of India under ministry of Culture and is a premier resource institution engaged in research, documentation, publication and dissemination of knowledge of the arts. It is visualized as a centre of excellence encompassing the study and experience of all the arts, each form with its own integrity, yet within a dimension of mutual interdependence and inter-relatedness with nature, social structure and cosmology. Through diverse programmes of research, publication, training, creative activities and performances, IGNCA seeks to place the arts within the context of the human environment. The arts here are understood to comprise the fields of creative and critical literature, written and oral; the visual arts, ranging from architecture, sculpture, painting and graphics to general material culture, photography and film; the performing arts of music, dance and theatre in their broadest connotation; and all else in fairs, festivals and lifestyle that has an artistic dimension. The fundamental approach of the Centre in all its works is both multidisciplinary and inrerdisciplinary. The work of the Centre is carried out by it five divisions, viz., Kala Nidhi, Kala Kosa, Janapada Sampada, Kala Darsana and sutradhara. It has a well-developed Media Unit for audio-visual documentation f rich and variegated cultural heritage of India on state-of-the –art technological platform and in production CD-Roms and DVDs. The Kala Kaosa Division of IGNCA investigates into the intellectual traditions in their multi-layered, inter- and multi-disciplinary dimensions. It works towards identifying primary concepts, fundamental the Indian world-view, which have permeated all disciplines and dimensions of life, bringing to light primary textual source material unknown, unpublished or inaccessible in the original language as also in translation, and placing before future generation the works of the savants who been pioneers in giving direction and light for comprehending the artistic traditions through a holistic vision, cross-cultural context, and multi-disciplinary methodology. As a research and publication division, it endeavours to place the arts within the integral framework of a cultural system, combining the textual with the oral, the visual with the aural, and theory (shastra) of a practice (prayoga). The Division has brought to light numerous titles on Indian arts under its three publication series – namely, Kalatattakosha, Kalamulashastra and Kalasamalocana. Under the afroresaid Kalamulashastra publication programme Kalakosa Divison, a critical edition of the Nevari version of the Natyashastra of Bharatamuni id proposed to be brought out in three volume and the work for the same is underway at the Varanasi Centre of IGNCA. This will be a unique contribution of IGNCA to the scholarly worlds, as this is for the first time that the manuscripts of Natyashastra from Nepal are being edited to prepare a new critical edition of this treatise, which unravel hitherto unknown areas of Indian arts. The Natyastra is widely acclaimed to be the fountainhead of all Indian aesthetic, artistic and performative tradition and is a luminous compendium of precepts and practices. 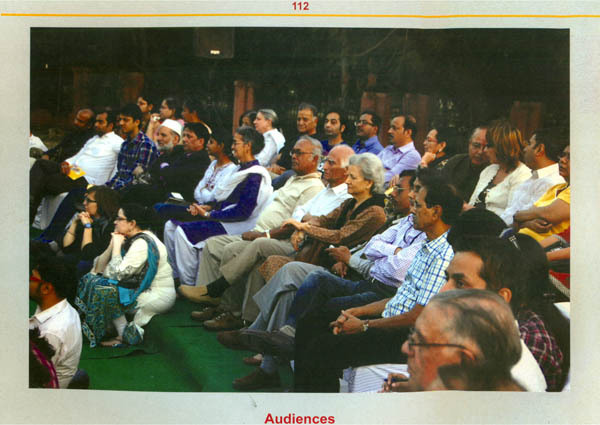 While commemorating the 25th anniversary of the established of the IGNCA, a festival based on’Bhand Pather’; believed to be based on the Sanskrit theatre-from ‘Bhana’ described in the Natyashastra was organized at the IGNCA. 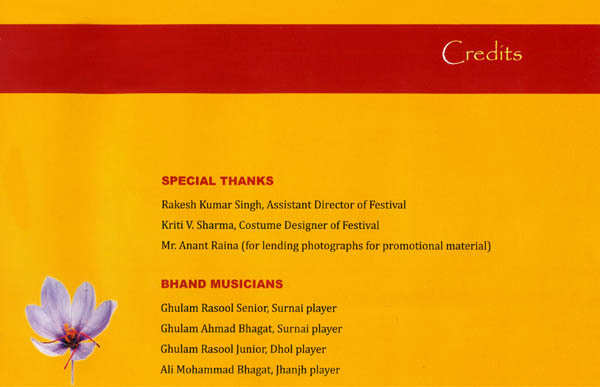 Bhana is one among the ten varieties of drama mentioned in the Natyashastra and Bhand Pather is an age-old traditional Natya-Prayoga (dance-drama) of Kashmir. Some scholars believe that the Bhand Pather has origin in the ‘Bhand Natyam’ mentioned by Acharya Abhinavagupta in his Abhinavabharati (celebratary of Natyashastra). ‘Bhand’ may be etymologized from the Sanskrit Bhana (a variety of drama) and ‘Pather’ from (Character). A set of scholars hold ‘Bhand Pather’ to be a derivative of Bhankta (devotee) who used in shrines in front of the deities. They substantiate their claim by the fact even today; the actors of the Bhand Pather are called Bhnagat or Bhankta. The Bhand Pather is agenerally performed in open spaces and performance begins with the Pather. The public at large from a huge circle around him, wherein the ‘Surnai-vadak’ (a wind instrument player) and ‘Dhol-vadak’ (percussion player) enter. The musicians fall in a line one side of the circle and amidst the sound of their music, the stage is set for the performance. Magun (probably from Saskrit Mahaguni) is the first actor to enter the stafge. Magun is a man with multiple talents and is a gifted actor, a skilled dancer, a deft acrobat and an accomplished musician, all at the same time. He is also responsible not only for providing direction to the Pathers to be played, but also ensuring smooth transition of this art-from to the next generation. A small wooden axe in his hand and a whip tied to is waist lends him a distinct and unmistakable identity. Amidst the boisterous beating of the drums, enter two or Maskharas (comedians) behind Magun and, the entire troupe pays their obeisance to the stage, quite in accordance with the prescriptions of the Purvaranga of the Natyashastra. 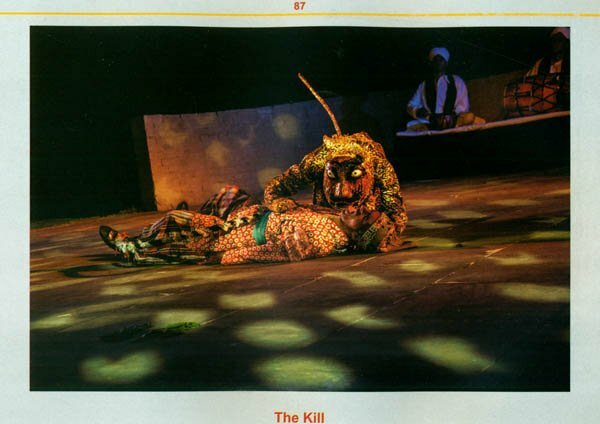 Thus the performance of the Pather begins. 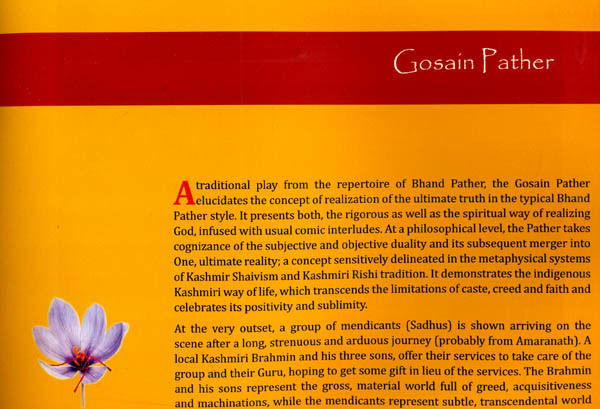 Bhnad Pather, the traditional folk theatre of Kashmir is quite simplistic in nature. 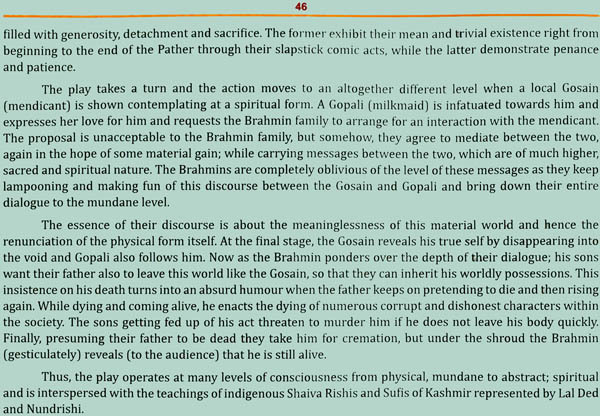 Interesingly, there is no pre-determined script, since it belongs to Guru-shishya parampara (master – disciple tradition); an oral convention, handed down from one generation to the other. Also, the acts often are independent of any prescribed costumes and make-up. The Bhand actors skillfully weave and infuse contemporary social, political, religious and other issues into the prevalent stories of the plays from the repertoire in such a manner that every performance has something fresh to offer to the audience. Although the themes are old, the performance is always new as it manifests itself in a new space and time. The creativity of the actors lies in their improvisations. Normally gents role play the female characters. Masks are also used sometimes to emphasize the character and of North Indian in the forms of Maskhara, Bhand, Naqqals, and other jesters. Prof. Farooq Fayaz of Kashmir University outlined the folk influences on the Bhand Pather and talked about its historical perspectives and political background in the light of its diminishing existence in the present day Kashmir. Prof. Triloki Nath Ganjoo, renowned scholar of Sanskrit studies and Sharada script, threw light on the socio-cultural aspect of Bhand Pather. Mr. M. K. Raina moderated the panel discussion and lent credence to this session by sharing his in-depth study, analyisis and personal experience of this art-from. The text of the presentations provided by the eminent scholars constitute the textual backbone of this illustrated monograph and the brief write-ups about the threes presented during the festival followed by some captivating visuals of each presentation provides it with a lustrous corpus.